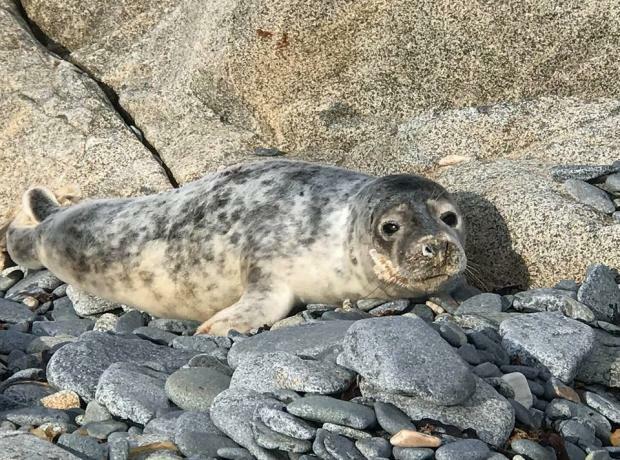 On Saturday lunch time the GSPCA were called out to rescue a 5th Grey Seal Pup. Now very late in the seal pup season the GSPCA thought 4 would be all that would need out help this winter until this weekend. Mambo as the grey seal pup has been named was rescued at Fort Doyle. The very thin poorly pup has a chest infection and discharge and is now in the intensive care area for seal pups at the GSPCA. "This Friday is the start of GSPCA Purple Week which you can find out about by going to http://www.gspca.org.gg/page/gspca-purple-week and this is to celebrate 146 years of the GSPCA and to help us help those animals in need it takes place between the 8th and 15th February." Every Autumn and Winter the shores of the Bailiwick see grey seal pups being born. In recent years every winter the GSPCA have helped rescue and care for grey seal pups. If anyone see's a pup with or without a mum we really do appreciate a call so that we are aware of its location and condition, but here is some advice. A healthy pup looks like a big, stuffed maggot without a neck. However, a thin pup looks sleek (but not bony) and has a visible neck, like a healthy dog. PLEASE DO NOT TOUCH THE SEAL. They can give a nasty bite, which will become infected by bacteria that live in a seal’s mouths. Note: Do not allow dogs or other animals to harass a seal. If a Seal is scared back into the water, it could then be washed out to sea by strong currents and be lost. You should not put a seal pup back in the sea as it may get into difficulty. Caution:- Handling of any animal either domestic, wild, dead or alive may be potentially hazardous. Obvious dangers include bites, scratches and general hygiene issues. Common sense should be applied in all instances and, if unsure, seek additional advice or assistance. Personal hygiene should be taken into consideration after handling any animal, whether it’s domestic, wild, dead or alive. To see some of the previous stories about seals please click here http://www.gspca.org.gg/blog/tag/seals . To get involved with GSPCA Purple Week http://www.gspca.org.gg/page/gspca-purple-week and help us help those in need taking place between the 8th and 15th February.